I like to step out of the box sometimes when it comes to fashion. That includes wearing a sequin skirt during the day. I mean really who said you couldn't anyway? The best thing to remember when it comes to pairing something dramatic during the day is to keep everything else basic. There are three key basics every woman should have in her closet; a simple white tee, flats, and a chambray shirt. The best thing about these basics are that they won't cost you much to have. These basics can take you from super casual look to dressing a statement piece more casually. I love tying a chambray top around my waist, it's functional during the summer (you have something to throw on when your inside a place blasting the AC) and it keeps your outfit looking casually cool. This look is a fun outfit to take to a brunch with friends or if you are so lucky, a casual day at the office to after work cocktails. The look can take you from day to night by switching out flats for heels and a red lip. Would you dare to wear a sequin skirt during the day? I love this! I really think sequins suit more casual outfits so much better, I would never be caught dead in a sequinned party dress as it feels a bit OTT/glam for me, but I love pieces like this skirt with a slouchy tee & dressed down like you have here. 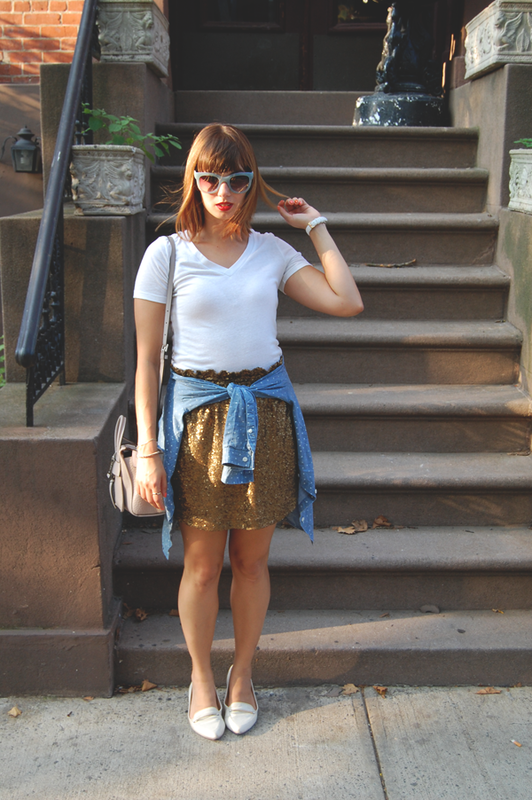 This is such a great way to incorporate a sequin skirt into a casual look!